"If you love beets, (which I didn't till I tried this) you'll love this! My Peruvian mother-in-law taught me how to make this extraordinary recipe! It goes great with fried chicken, but I usually make it when I make my Puerto Rican arroz con pollo. My husband refuses to eat chicken if I don't include this salad." Fill a large pot with water, and add beets. Bring to a boil over medium-high heat, and cook for about 30 minutes. Add potatoes to the water, and continue to cook for another 30 minutes. Add carrots, and continue boiling until everything is soft, about 15 minutes. Drain, and let the vegetables cool until cool enough to handle. Cut vegetables into cubes, and place them in a serving bowl. Stir in mayonnaise and mustard until everything is well coated. Serve warm. Fresh broccoli with lots of bacon, grapes, almonds, and a sweet, tangy dressing. Great, colorful presentation. Okay flavor, somewhat lacking. I encourage anybody making this dish to add their own pizazz to it. This was fantastic! I've made it a few times & love adding chopped hard boiled egg & celery. I definitely recommend cutting up the veggies before cooking, as other reviewers suggested. 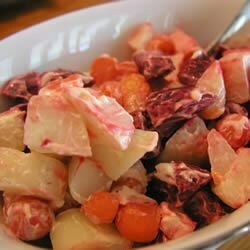 I was not a beet fun, now I use this recipie regularly and really enjoy this salad!